I think the ability to haul more gear is a tremendous plus to the TI over the AI. Of course, I don't look at either of the boats as race boats, but as "adventure" boats. The ability to take some extra comforts, or some extra safety equipment is a great plus. I also agree with vtwave, and think that the TI will do just fine in the EC as time goes on. Solo users may have to furl the sail just a little bit, or maybe the TI is best sailed with 2 instead of 1, but the TI is not a fragile boat, it's a different boat, and it may have to be sailed differently than the AI. Certainly pedalling the AI solo is going to be easier than the TI, but I think over the coming years, you'll see TI's coming into their own. You would think a TI with two on board would be at a tremendous advantage, as the crew could spell each other and not have to lay over to rest. That's the key, I think, to creating an advantage with the TI. The ability to have a second brain to help navigate, a second body to do the work to give the first person a mental break, even if it's not an actual rest. The TI is still a good boat, it may not find life as an EC race boat yet, but it's definitely the boat that I'd choose for open water camping trips. from experience more gear hauling ability isn't always a plus. Sometimes less is more. As per a TI enabling a sailor to sleep or otherwise check out while underway I think you are overly optimistic on that front. We slept at the same time on the Nomad and I doubt either of us could have slept while the boat was moving. However our planning kept that far from reality. That said I still think a TI has a place in the EC. Sailed correctly is has a very good chance of finishing. It's 300 miles in 8 days, we did it in 4 days, 10 hours+, and we never suffered. We were lucky but I took this from it, go like heck when you can, keep the shore to port, maximize your vmg when you can, know your limits, sleep often, and have fun. Otherwise go home! The issues the TI's in the Challenge have faced are well known by those with early model TI's and have been addressed by Hobie. The ama bungee snapping is very rare. This was the first I have heard of that problem and looks to have been a maintenance issue. I see no reason why a properly prepared TI could not finish the race. I agree with augaug, vtwave and Tom K. With 90sqft of sail you need to have common sense on when to use all of it. At almost twice the sail area of an AI you have to furl it sooner than you would on an AI when the winds pick up. Since I've been sailing my TI this way I've had no problems. Just as an example we were out sailing yesterday in around 20knots of wind. I had the TI sail furled to about the telltails and my mate in my AI did not furl. With 2 on board the TI we were still quicker. 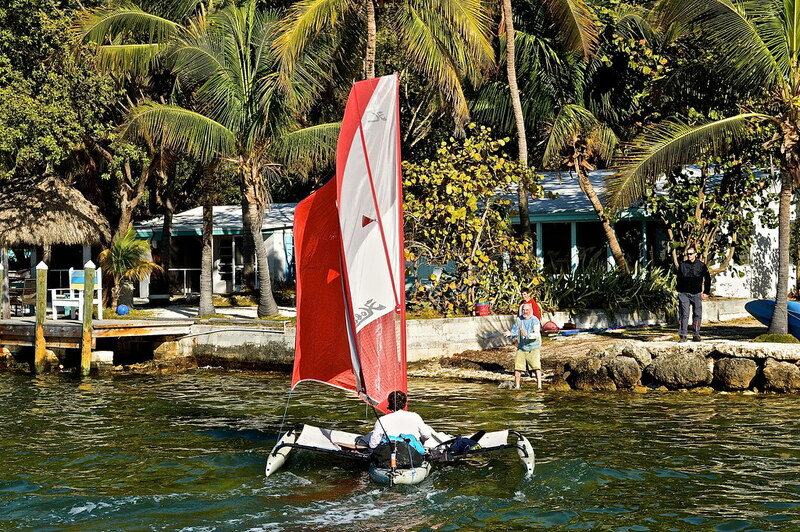 I did the race in a boat that has similar weight characteristics and the same sail area as a TI. The vaka is narrower and the amas much more buoyant. My rudder is balanced and three times the size is a TI. My furling mechanism uses Hobie parts. My boat has a lot more storage capacity and I carried WAY too much gear. I was also able to carry more redundancy, three masts, two mirage drives, and two spinnakers. I was able to sleep on broad and the boat is more user friendly in that it self steers and I was able to easily move around the boat to manage the spinnakers. The secret to my faster time is that I sailed 66 hours out of 93 hours to finish. I sailed fast as possible but also as long possible. The leaders always stay on the leading edge of the weather front and ride it all the way to the finish. I lost the front on the third day, which cost me a lot of time. I didn't have the foresight to maximize my sailing time when the wind was blowing hard. Call it stamina or will power, maybe inexperience. A second crewman would have helped there but I'm not sure the extra load would have been worth it. My boat might not have been fast enough to stay in the front. The leader averaged 6 mph which means he probably did 8 or 9 in open water. I averaged 3 overall and 4.4 moving. Before the wind died, my average was right around 6. The only time I would have felt that the TI might not have been able to do what I did in the tamanu was entering Caxambas Pass. I nearly broached but the large deep rudder saved me. Could I have done it in a TI? I'm ninety percent sure I could, otherwise conditions weren't that bad. As far as pedaling a TI solo? No big deal, I pedaled 40 miles out of 290, most of that against the tide. I went slower. Probably averaged 2 mph pedaling, max of 4.3. That's another place I saved time, I totally ignored tide state. I passed a lot of people who were waiting for the tide or daylight. Look at JollyRoger, his boat was almost all Hobie TI parts and he finished in 72 hours and did the nightmare. He didn't break anything. There is a lot of luck in this race and lots time for random chance to swoop in and ruin the trip. I will certainly agree with all of you, when the Tandems start finishing the EC. At the same time, for the solo EC competitor, the AI is the boat of choice. I'm looking forward to the "AI II" or "AI--the next generation" or "AI magnum." I think Hobie is going to bring out an AI that will compete with the Tandem on speed. Now, wouldn't that be fun. Kayakman7 said, "I pedaled 40 miles out of 290, most of that against the tide. I went slower. Probably averaged 2 mph pedaling, max of 4.3." Jesse, how old did you say you were? Lol, 35. Yeah, I know. I could have waited for wind in Florida Bay, that was my choice. It was blowing like mad a day later. The forecast said I would have wind a few hours later so I went for it. Dogslife probably would have beaten me if i had waited for the wind and beating all the AIs and TIs was important to me, it vindicated my decision to buy and fit out the tamanu instead of using my TI. My point was that if I had sailed the TI solo, I think I would have been only a few hours behind my actual time. Maybe not though, much of the race was downwind- the weakest point of sail for a TI. Flying the spinnaker is much harder on the TI. OK, Jesse, next year you can do it in a Tandem, proving that a 36-yr-old on a Tandem can get it done--if a little "bad luck" doesn't swoop in and spoil it all. Nice job this year, Jesse. Congratulations! When you say "... a TI is a lot of boat to push into the wind." I'm assuming you're talking about pedaling it into the wind? I know from the rear seat, operated solo, the TI requires a certain amount of speed in order to keep it straight. It's definitely a bit more work than the same operation in the AI. I need to try it a bit more from the front seat. My experience in sailing a TI is that a headwind is of great use. It covers ground, fast. Terrific comments and dialog from the watertribers. Thanks guys. The EC is a great overall test of boat and crew cuz it has so many unique moving pieces. The race you prepare for is not necessarily the one you must run. Having a choice of Hobies gives one a great advantage. But others. like Jesse and Rodger decided to build their own ultimate challenge boats, using TI parts, which is a great compliment, I think to the core design of the Hobies. The TI is a faster, more stable boat, closer to the "ultimate" than the AI, but as Keith says, the AI is easier to haul and far more forgiving, when sailed on the edge. In an endurance vs speed race, that may be what gives the AI the advantage. Fewer surprises. But can the TI take a beating? Hell yea. Take another look at Kelly's Hawaiian channel crossing videos. All he broke was the Akas! I would prefer not to do that in my AI. I'm encouraged that Jim from Hobie has made the trip in both boats, proving that the design team does not live in a total yacht club bubble. But I'm a bit disappointed we didn't see next gen prototypes in this years race. Though jolly rodger may be on to something,.. Odd, mine seems to point and move fast to windward. I can get right to about 45 degrees to the wind and make good speed. Maybe the way the boat is trimmed has something to do with it. I've been experimenting with where I put things lately, to see what effect having more or less weight in various places has.